This icon portrays the Theotokos holding the Christ Child in the first Burning Bush, that which the Prophet Moses saw. 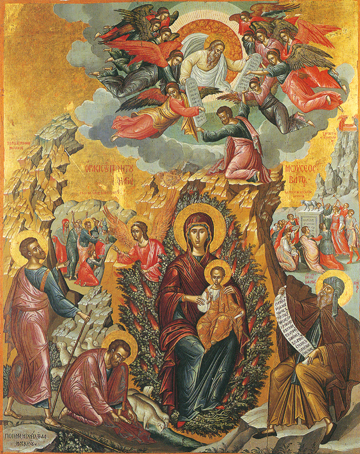 Around the Theotokos and her Son are many scenes from the life of the Prophet Moses. To the left is Moses taking off his shoes for he is entering into holy ground. On the top of the icon is Christ, as the Ancient of Days, pictured surrounded by angels, handing down the Ten Commandments on two tablets of stone to Moses. Behind the Theotokos to the right are the idolatrous Hebrews who began to worship a golden calf while Moses dwelt on the Holy Mountain receiving the Law from God. Behind and to the left are many drinking from the spring of water that sprouted up when Moses struck the ground with his staff. And to the right of the Theotokos is St. John Damascene who composed the hymn that inspired this icon which compared this second unburnt bush, the Mother of God and her eternal virginity, to the first Burning Bush which remained unburnt. Written by the Cretan painter Michael Damaskinos in the late sixteenth century, the icon is now found at St. Catherine’s Monastery in Sinai, the site of the Burning Bush.